Living IndyCar legend Scott Dixon did indeed get a fu@&in’ move on as he so forcefully said Sunday in Toronto, cruising to his forty fourth career victory. It was his third of the season, padding his now comfortable championship lead, particularly with the regrettable Mid-Ohio in the offing and pole sitter Josef Newgarden’s brain fade, slamming the wall from the lead mid-race. NBCSN’s pre-race included multiple mentions of the Alexander Rossi – Robert Wickens rivalry by Daffy Leigh Diffey, which didn’t play a role at all in the race. More telling was an interview with the eventual victor, who once again took the blame for his qualifying mistake on Saturday, the classy guy that he is, accepting responsibility for starting second rather than pole. Then came the obligatory interview by the ever expanding universe that is Paul Tracy with James Hinchcliffe and Wickens. There was plenty of talk about Canada and in Canadian, as best we could gather. How did they do it? Who’s the soothsayer? What were they on? These are the questions they’ll be asking about IRR in future annals of IndyCar blogs, at least if we have any input. Scott Dixon scored his 42nd career win, tying Michael Andretti for third all time behind his dad and AJ, marking his fourteenth consecutive season with at least one win. He won handily over Ryan Hunter-Reay and Alexander Rossi in a Honda parade through the heart of downtown Detroit, though it was his first visit to victory lane since Road America last season. As for what little pre-race there was, the ABC booth took on the somber tone of a wake, or would have had it not been so sleepy. After the obligatory, outrageous Power 500 recap, Jan Beekhuis spoke with pole sitter Marco, who insists upon repeatedly referring to his many “outside poles,” or what everyone else on the planet refers to as starting second. 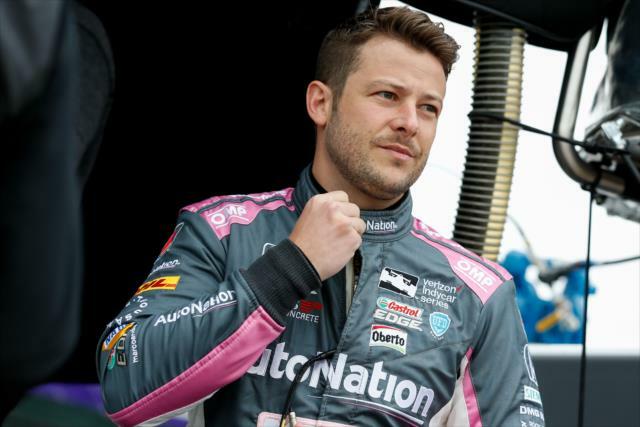 The legacy driver on an eight year drought fibbed and said he “thinks we can pass pretty well here.” But the bigger story would be his burgeoning feud with a teammate – one who’s actually won the Indy 500. A quarter of the way through the 2018 IndyCar season’s a terrific time to stop and assess who’s been exceeding expectations – by pointing out who hasn’t been. Besides, what else are you gonna do with yet another off putting three week gap in this joke of a schedule? Discover who’s about to get thrown under the Holmatro safety truck and – more importantly – who deserves to be. Max “Paris” Chilton leads this ignominious group, part of the unimpressive new British outfit called Carlin Racing. Unable to make the cut with Ganassi during a couple of woeful seasons despite bringing money to the table, he’s doing no better this year. Chilton sits twentieth in points, last among drivers who’ve taken all four green flags. IRR lets readers in on a sizable statistical secret. A significant part of the reason we’ve been so successful in our IndyCar predictions the last few years is simple mathematics. Or – more precisely – damned statistics. It’s a pity we haven’t been putting the information to better use by wagering boatloads in Vegas. No, we’re not a stats site as our readers well know. It being tax time, we’re particularly afraid of figures at present. Lord knows there’re enough purely statistical destinations out there and – other than this article – stats and humor go together about like NPR and Alabama Slammers. They’re just too damned different in their purposes. This week’s special prediction for the Toyota Grand Prix of Long Beach is another Penske pavement party. The team’s won a majority of races going back years – not to mention poles, championships, et cetera – with defending champ Newgarden’s win at Phoenix merely serving as the most recent example. When it comes to pole, semi-retiree Helio started first in SoCal the last three races. By anyone’s calculation, the team’s peerless. Riveting racing in IndyCar’s return to action Sunday was largely overshadowed by shabby coverage from the Always Being Crass network in hopefully its last year broadcasting the series. Sebastien Bourdais survived the near constant carnage to repeat at St. Pete in a race featuring a whopping 366 on track passes. Fans maybe got to see ten percent of them. Given the sheer frequency of commercial interruptions, one would have thought the local newscaster the victor. An asinine infomercial ran until ten minutes before the green flag. With so much new this year – gorgeous cars, rookie drivers and fledgling teams – the hyper abbreviated “pre-race” was in reality a slap in fans’ faces. Considering it’s Bestwicke, Goodyear and Cheever in the booth however, perhaps it wasn’t such a great loss. Will “Sour Grapes” Power’s first lap spin surprised even those of us predicting early trouble, and boy did it materialize. Even Scott Dixon suffered a rare brain fade worthy of a rookie – or worse, Marco – smacking Sato and instigating one of eight caution flags, five of which came in the early going. Old ‘n in the way TK and rookie Zach Veach made contact before Ragin’ Graham Rahal banged into Spencer Pigot, bringing out yet another yellow. Previewing the 2018 IndyCar season from the perspective of those nine new drivers with a combined total experience of the average couch sitting race fan. Alarmingly, rookies will make up a full third of the IndyCar field this season. Featured first are a pair of teams – one new, one not – opting for rookie teammates of all things. Talk about letting the children lead! Rene Binder is the first Austrian IndyCar driver since Joseph Jagersberger in 1911, who started the inaugural Indianapolis 500, then called the International 500-Mile Sweepstakes Race. Binder’s Juncos Racing team is also brand spanking new, moving up to the big league from Indy Lights, where they won the championship last year. The 26 year old will share the partial season ride with his rookie teammate and Lights champ, Kyle Kaiser. Why Binder, you ask? Because he brings sponsorship with him in the form of Binderholz. IndyCar finds itself in the midst of change not seen in a decade – welcome change, at that. The 2018 season excitingly ushers in new cars, a multitude of rookie drivers and even several fledgling teams. There’s a first time reigning champ and let’s not forget new sponsors, either. Lots of ’em – on Graham Rahal’s car alone. Heck, there’s even sort of a new track on the schedule. That is, if you possess little memory and consider Portland a track in the first place.